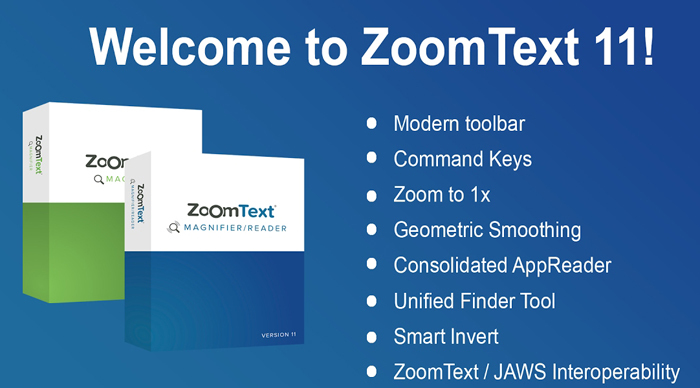 ZoomText Magnifier/Reader is a fully integrated magnification and reading program tailored for low-vision users. Magnifier/Reader enlarges and enhances everything on your computer screen, echoes your typing and essential program activity, and automatically reads documents, web pages and emails. Full range of magnification levels up to 36x (up to 60x in Windows 8). Levels include: 1x to 8x in steps of 1, 10x to 16x in steps of 2, 20x to 36x in steps of 4, and fractional powers of 1.25x, 1.5x, 1.75x and 2.5x. 30 levels of magnification in ZoomText 10.1: 1x to 2x in steps of 0.2; 2.25x, 2.5x, 2.75x, 3x, 3.5x, 4x, 4.5x, 5x, 6x, 7x, 8x; 10x to 16x in steps of 2; 20x to 36x in steps of 4; 42x, 48x, 54x, and 60x. You can zoom in and out using All Zoom Levels, Favorite Zoom Levels Only or Whole Power Levels Only. Favorite Zoom Levels uses a custom set of user-defined zoom levels for zooming in and out. You can choose any combination of zoom levels to define your favorite zoom levels. * Windows 10, 8.1 or 7 with Service Pack 1 (or later). * Processor: 2 GHz i3 dual core processor or similar. i5 or i7 recommended. * 4 GB Ram. 8 GB recommended. * Video/Graphics card or integrated graphics with support for DirectX 10 or higher. * Hard drive space for ZoomText: 1.3 GB SSD drive recommended.Note: After installing ZoomText, use of hard drive space can be reduced by uninstalling unneeded voices. * 5-point multi-touch display for touch screen support. * USB 2.0 for ZoomText Camera support.